Between 2007 and 2011, the National Fire Protection Association (NFPA) reports that 13% of all home fires were the result of electrical issues, including cooking equipment, heating equipment, and electrical distribution or lighting equipment malfunction. 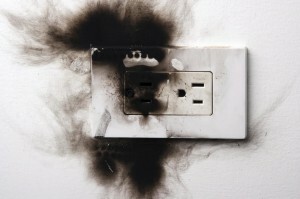 The latter accounted for 6% of all electrical fires, ranking fourth among major causes. And in 79% of home electrical fires, the fire spread beyond the object where the fire started. In the United States, 50,900 home fires each year are attributed to electrical failure or malfunction, resulting in 490 deaths and 1,440 injuries, according to Electrical Safety Foundation International (ESFI). 63% of the electrical fires involving electrical distribution or lighting equipment were caused by wiring or related equipment malfunction. One way to help prevent such issues is with Panel Box Upgrades. You might not always think about it when you’re plugging in your electronics, but modern electronics draw much more electricity and wattage than they did a few decades ago. Is your home designed to deal with the increased electrical demand? Probably not. Central air conditioning and modern appliances, like dishwashers and computers, can place too much stress on an old circuit panel. The solution: panel box upgrades. Upgrading a panel box, also known as a “heavy up,” accommodates the demands of these appliances, and greatly reduces the chance of an electrical fire or other disaster. TriStar Electric can handle your panel box upgrades. Our team of electricians has the experience and training needed to perform panel box upgrades safely and efficiently. In addition, we also can replace circuit breakers, breaker boxes, and subpanels. We recommend and install top quality Square D and QO panel boxes and circuit breakers, which have a reputation of being the best in the industry. Our electricians will inspect your home’s electrical system, including your current panel box, discuss your energy needs, and make sure that we answer all of your questions before drawing up our proposal. We can also handle all permitting and, when the work is done, you can expect a follow up visit to ensure everything has been handled correctly. If you are interested in learning more Panel Box Upgrades, please contact TriStar Electric by calling 410-799-5791 or 301-384-8880 or fill out the contact form on our website. Our electricians will answer your questions and provide you with expert advice. This entry was posted on Thursday, November 13th, 2014 at 8:47 pm. Both comments and pings are currently closed.